My husband, one-year-old son and four-year-old daughter recently returned from a ten-day road trip halfway across the U.S. Not only did our trip exceed our expectations, tenfold, we managed a California beach vacation on a budget. Honestly. Here's how we did it. We drove. Not withstanding the price of gas it was much cheaper to drive than buy 3 plane tickets and rent a car. But we chose to drive strictly for the experience. We made the time in the car an adventure, playing games and singing, and sometimes, of course, bickering. We sacrificed luxuries. With enough food and drinks packed in the SUV for two days, we ate out little, and slept cheap. We made two overnight stops at interstate hotels en route to our first destination, San Francisco, where we visited an aunt. During the short stay, we enjoyed a walk around the Bay and, of course, Pier 39. Then, we headed south down Highway 101 to Venice Beach, our beach vacation destination. We booked our lodging at the last minute. We planned the trip ten days before we departed, and were lucky to find a great site called Vacation Rentals by Owner and book a perfect, locally owned place right on Venice Beach, Su Casa. With little more than a week until our arrival, we were able to negotiate the rates. Su Casa has 12 flawless, ultra-modern units, and feels like a private beach condo but provides full hotel services, such as house-keeping, laundry, complimentary breakfast and room service from the well-known Figtree's Café right downstairs. Compared to other rentals, it's also very affordable. What's more, with accommodating and kid-friendly personnel (who brought our little girl cookies and milk upon our arrival), we will definitely be returning to their casa in Venice Beach. We didn't book a single tour or attraction. 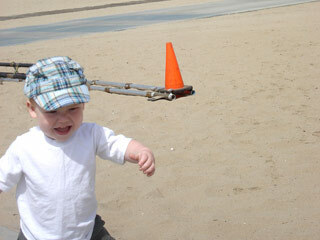 Instead, we found family friendly activities frequented by Santa Monica and Venice Beach families. With beach cruisers compliments of Su Casa, we biked the South Bay Bike Path every day, pulling the kids in a buggy we rented on the Boardwalk. The rides at Santa Monica Pier may as well have been Disneyland for our four year-old ($10 for a day-pass). The 3rd Street Promenade and Venice Canals were a paradise of fun sights and stores. Not to mention great food. At the end of the day, we stopped on the Boardwalk for afternoon drinks and people-watched while the baby napped in the buggy. And we used the car only once during our six day stay!. We used our imagination. We purchased produce at the Farmers' Market to make fabulous dinners. We opened a bottle of Two Buck Chuck from Trader Joe's and enjoyed the sunset and Boardwalk scene from our window or balcony while the kids slept soundly. We discovered that Southern California has it all. Vast white beaches, cuisine, excitement and fascinating people. With an open mind and lots of patience, an eccentric location like Venice Beach can be the perfect, as well as affordable, family destination. Copyright © Rhonda Crone. All rights reserved. Rhonda is the author of the blog RhoRho's Bistro.